What would you do if you’re 20 and a guy hit on your girlfriend? Get jealous? Punch him? Be flattered? And what would you do if the hitter was 40 years older than you, played a rectangular guitar, and was a bona fide blues legend and member of the Rock and Roll Hall of Fame? I’ll tell you what I’d do. I’d write a Song of The Week about it. It all started with the pogroms in the shtetl of Częstochowa (Poland), as does so much of our history. Joseph Czyż fled to Chicago, where he toiled in the booming bootleg business till he had the gelt to bring over his wife, daughter Malka, and sons Fiszel and Lejzor. After fighting the Nazis in the war, the now-American Phil and Leonard Chess opened a night club, which evolved into the Chess Records recording studio, specializing in the new electric blues. Who ever heard of such a thing, Jewish entrepreneurs and black artists? As early as 1951 they got Sam Phillips to send them up some talent from down in Memphis, such as Howlin’ Wolf and Rufus Thomas. They signed and recorded such luminaries as Muddy Waters, Sonny Boy Williamson, Etta James, Chuck Berry, Willie Dixon and our Songmaster of The Week, Mr Bo Diddley. ‘Cadillac Records’ and ‘Who Do You Love’. ‘Who do you love?’ Now there’s a question. Hold your horses, we’ll get back to it. 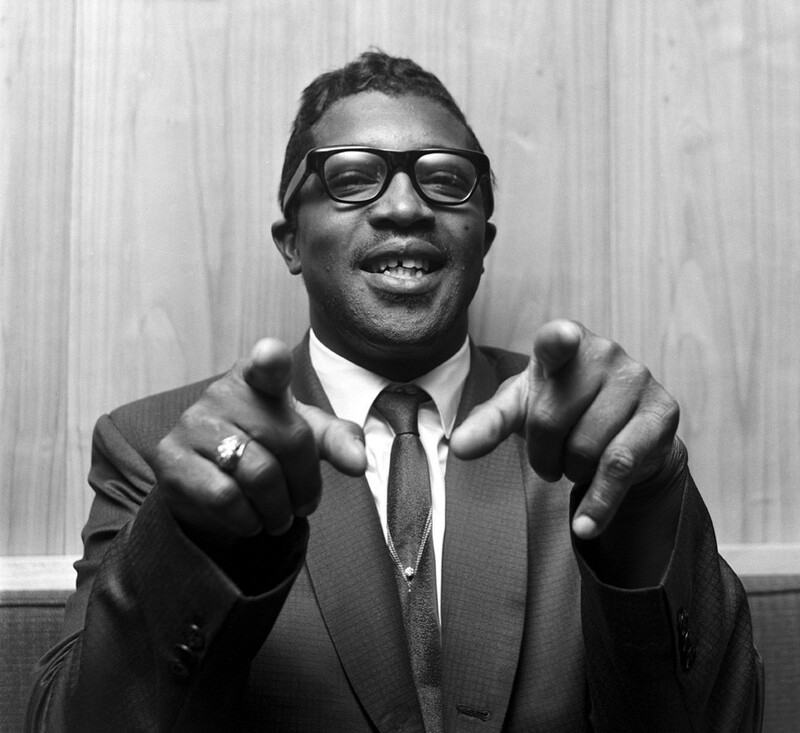 Bo Diddley (1928-2008) was born in McComb, Mississippi as Ellas Otha Bates, but took on the surname of the relative who raised him, as Ellas McDaniel. The source of his stage name is a subject of some dispute, but there are those who say it goes back to the 19th century, ‘diddly’ being a truncation of diddly-squat, while bo is an intensifier. In other words, ‘Absolutely Nothing’. Bo’s early exposure came in 1955 on the Ed Sullivan Show, singing the eponymous ‘Bo Diddley’, his version of ‘Hush Little Baby’, aka ‘Mockingbird’, as later covered by Charlie and Inez Foxx, James Taylor and Carly Simon and Eminem. I heartily disrecommend employing any of those versions to try to lullaby your kid to sleep. Go for the Joan Baez version if you must. If you’re trying to relax me, go for this charming Bobby McFerrin/Yo Yo Ma version, okay? Bo didn’t made it commercially with the mainstream (white) audience in the 1950s (in contrast with Chuck Berry). 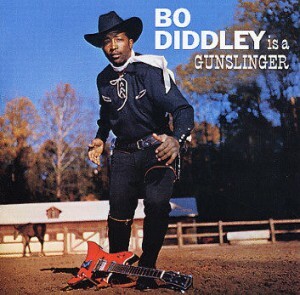 ‘Bo Diddley’ went to #1 on the segregated R&B chart, but didn’t even dent the vanilla Top 40. He gained wider recognition via his impact on the rougher British Invasion groups, such as The Who, The Animals, The Yardbirds, and of course The Stones. But his string of hits in the late 1950s and early 1960s that left an indelible imprint on rhythm and blues, rock and roll and early rock rivaled by few of his peers. Here’s a live 1965 performance for a bunch of white kids. Nothing suggestive about the chick singers’ moves there. Pretty Thing – written by stablemate Willie Dixon, a great example of The Bo Diddley Beat. It’s a “3-2 clave rhythm”. I have no idea what that means, but you can read all about it here and explain it to me, if you’re so inclined. You Can’t Judge a Book by Its Cover – “I look like a farmer but I’m a lover/You can’t judge a book…”; truer words were never spoken. ‘Not Fade Away’ – it’s one of Buddy Holly’s greatest songs, famously covered by The Rolling Stones and The Grateful Dead, but it’s got Bo all over it. But for our SoTW, we’re going for that apocalyptic wonder, ‘Who Do You Love’. Now come on take a little walk with me, Arlene, and tell me, who do you love? A tombstone hand and a graveyard mind, just 22 and I don’t mind dying. I rode around the town, use a rattlesnake whip, take it easy Arlene, don’t give me no lip. The night was dark, the sky was blue, down the alley, the ice-wagon flew. It hit a bump, somebody screamed, you shoulda heard just what I seen. Do you want to tell me that Dylan could have written ‘Highway 61 Revisited’ without standing on Bo’s shoulders? That’s one single chord Bo is playing there. ‘Hoodoo You Love’ actually doesn’t use Bo’s trademark beat, but rather a “modified cut shuffle beat” giving it an almost rockabilly feel, similar to Chuck Berry’s ‘Maybellene’. The song was covered by Ronnie Hawkins and his backing band The Hawks way back in 1963. The guitar work there by one Robbie Robertson is said to have precursed and inspired a whole lot of stoned longhairs in the decades to come. Here Ronnie reunites with The Band in ‘The Last Waltz’. The song became a rock template for extended guitar solos, most notably by Quicksilver Messenger Service and George Thorogood. But I keep going back to Bo’s inscrutable original. If I ever teach Freshman English again, I’m going to give them ‘Who Do You Love’ to parse. Bo was a legend in his time. In 1989, Nike shoes made this very funny commercial about multi-sported Bo Jackson and our Bo. Where did all that swagger come from, you ask? You should have figured that out ten minutes ago. After his death, Mick Jagger said “He was a wonderful, original musician who was an enormous force in music and was a big influence on The Rolling Stones. He was very generous to us in our early years and we learned a lot from him…We will never see his like again”. There’s so much more I’d like to say about Bo, such as his album covers, relationship with his valet, one Marvin Gaye. But this has gone on long enough. I’ll just address that one question I posed at the beginning. 1969, I’m working in Cincinnati with my buddies Michael and Bill at the Ludlow Garage, where we hosted rock acts such as Santana, Grand Funk Railroad, B.B King and The Kinks. (Here’s one story about my experiences there). Our job consisted of selling tickets, cleaning toilets and general gofering. I was dating a girl named—um, named—well, I’m sure I knew her name at the time. I left her at the post-Bo show bash while we went on the run across the river to Newport to buy the booze. I don’t know how we did that, since none of us had yet achieved majority. I guess they weren’t too uptight about that stuff in Kentucky. In any case, I sure hope they’ve erected a statue of limitations for underage interstate bootlegging. When I got back to the place, the girl told me that Bo had been hitting on her, but apparently now he was seriously distracted by the goodies we’d brought. I don’t remember her name (I like to imagine it was Arlene), but I sure do remember being seriously flattered (there’s your answer, folks) and relieved I’d made it back in time. And I remember Bo being a really nice guy. But most of all, I remember that luminous hoodoo music he left us. There’s one question we’ve left unanswered: Who do you love? I guess we’ll leave that for next time.